In fact, inexpensive birthday gifts can be some of the best birthday gift ideas. But, you must shop wisely and be creative. Here are some shopping tips to keep in mind. 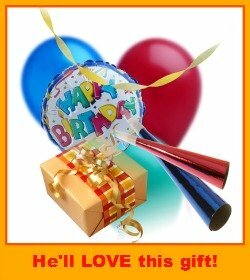 Look for unusual gifts when shopping for cheap birthday gifts for him. Take a little extra time to shop. Being open to different types of gifts can score big presents for men! Keep an open mind. If you're flexible in what you're looking for . . . you'll for sure find a great inexpensive gift! Be creative. If you don't want to spend a bundle on a gift - creativity can outweigh the dollar value by far. You can spend a lot less money and give an even nicer more personal gift. Here are my tops picks for personalized inexpensive birthday gifts for men. These are under $25! If you're looking for inexpensive birthday gifts for your boyfriend, make your own t-shirt! This is one of our best birthday gift ideas. A great site to check out is Zazzle Custom T-Shirts! You can create an awesome t-shirt easily. It's easy to upload your own photos to personalize it. A smokin' deal for only about $15 bucks. Need personalized gift for less? Looking for cheap personalized gifts? Here are some great t-shirts for your Dad that he will love! These personalized Ties are the coolest thing I've ever seen! I really like the dog tie! I know quite a few men that would definitely wear that one! This is a pretty cool personalized wallet. It also has a money clip which makes the wallet thinner. Good choice for inexpensive birthday gifts under $25. Here are my top picks for cheap birthday gifts for him under $50! Does he like to fish? He'll love this personalized fishing chair. A Personalized Fishing Bucket is a very popular birthday present. My brother, Robert would love this! Here are more Inexpensive gift baskets under $50. These are really nice gift baskets! Create a love note jar with hand-written notes that express your love and fill the jar. Remind him of fun things you've done together. Or the 50 top things "I love about you" - number each note and write about one of his many attributes. Use pretty colored paper and different colored inks. Decorate each note and the jar creatively. Add a few "surprises" with a note saying: "Good for one. . . " whatever you want to add! He's gonna love love love this! Make an Instagram photo book. Save 15%. Use favorite pictures of things you've done together. Add a few special love poems or funny stories. Write a love letter at the end of the book - kiss the paper (with your lipstick on) to add a sweet touch!